Fancy a sit-down and a catch-up? An innovative art piece created by the charity Action Mental Health and funded by the Big Lottery Fund and Arts Council of NI’s Culture for All programme could double up as a place to sit and tell your story. 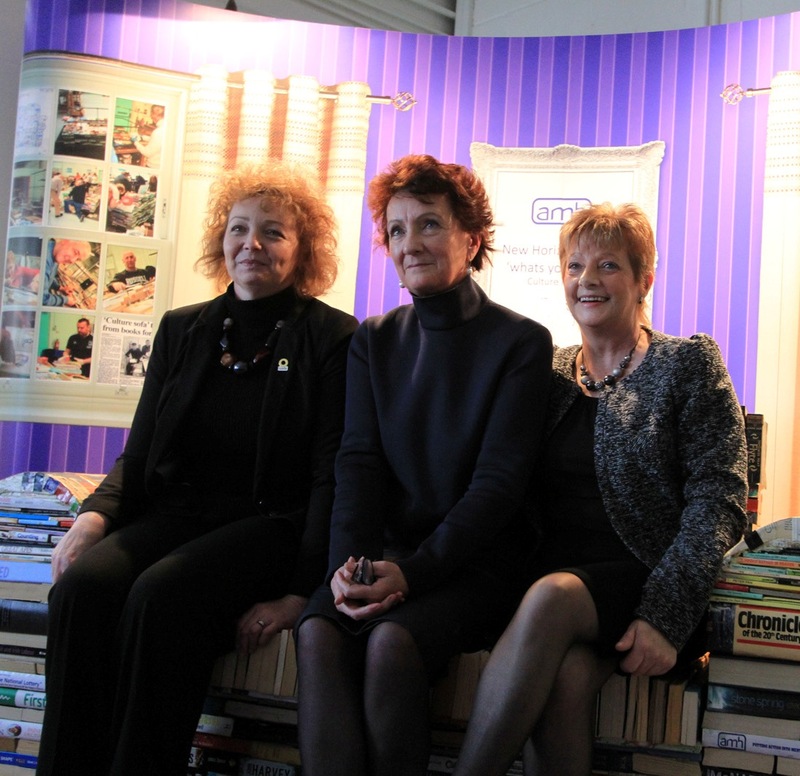 ‘The Sofa’ was created by the charity in Derry using hundreds of books donated by individuals including local celebrities, authors and the people involved in the project. Part of AMH New Horizons Foyle’s ‘What’s Your Story’ project, the piece reflects literary and musical cultures across the generations and will now journey around Northern Ireland. The Culture Minister Carál Ní Chuilín recently led the unveiling of The Sofa on World Mental Health Day, 10th October. I also got a chance to test it out for comfort along with Roisin McDonough, Chief Executive of the Arts Council and Mickey Harkin, AMH Service Manager. Culture for All is a small grants programme that offered grants of up to £10,000 to communities across Northern Ireland wanting to play a part in the UK City of Culture celebrations in 2013. The aim of the programme was to bring people together to enjoy a range of community-based arts and culture activities, encourage talent and increase skills and opportunities for volunteering. AMH New Horizons have certainly achieved the programme aim – congratulations. ← Every man needs a shed!